A number of fixed garbage bins were installed on the beach of Sanya Bay this Monday, aimed at helping raise the public’s environmental awareness and giving beachgoers an easy and convenient way to dispose of their trash. Last June, a nearly one-kilometer long trail of garbage was left on the beach when the tide ebbed. According to garden workers in Sanya Bay, after each fishing moratorium or storm tide, the beach is scarred by domestic waste. 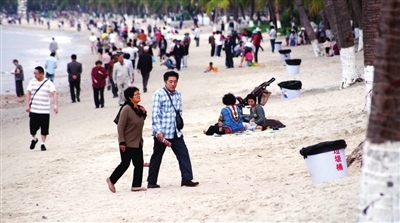 Every year, Sanya Bay attracts numerous residents and visitors for sightseeing and leisure activities.